Most fiction in the Jane Austen universe focuses on the gentry, much like the original novels. So I was intrigued to see Don Jacobson’s recent Austenesque publication – paired novellas in Lessers and Betters – also includes the servant perspective. Don’s approach struck a chord, as it’s something I’ve tried to do within the Charlotte Collins Mysteries, and I got in touch with him. Given his position as a prolific and well-established author in the genre, I was delighted Don agreed to answer a couple of questions about this approach, his writing, and the future of Austenesque novels. Q: You’ve written about describing fiction in this genre as Austenesque rather than JAFF (Jane Austen Fan Fiction). So how do you think “JAFF” is evolving in terms of literary endeavour and audience? First of all, thank you for this opportunity to express my thinking. Like you, I am a bit of a queer fish in the world of Jane Austen Variation writing. The two of us included, I think I can name maybe five male authors specializing in this genre (Collins Hemingway, C. Don Miller, and Jann Rowland). Of course, we will immediately get a dozen responses of the “what about…” nature. So, forgive me, outraged readers. Part of my process is to create work that I would like to read. Now, I realize that this is not different from any other author who takes pride in the work created. What I have never been able to do is to write in a “tribute band” mentality. There certainly is a school which views the themes and memes established in the Canon as sacrosanct. That is their prerogative. 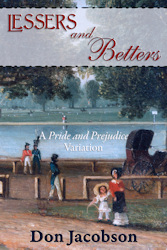 And, stories which hew closely to the character lines laid down by Austen can be and are amongst the best I have read. But, I believe there is…and over the past three years have seen…more to the universe created by Jane Austen than one story after another of how Darcy and Elizabeth meet, break apart, reconcile, and go all HEA. 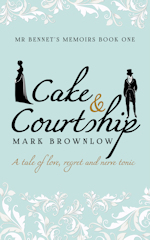 All stories begin and end in a replay of what Austen so aptly wrote as a romantic social commentary 200+ years ago. What is lost is the commentary. What remains, as pleasing as it may be, is the romance. Thus, I have drawn the distinction between “Fan Fiction,” which is a tributary inhabited by those who want to offer up more Austen in a manner in which the Lady herself might have written if she had survived after 1817, and authors seeking to evolve the Austen Universe into its own literary genre. Much as Somerset Maugham and Graham Greene created the modern espionage suspense genre in the 1940s and 50s, inventive authors are taking the Regency World chronicled by Austen and evolving it into something different. Consider the work of Gianna Thomas, a certain Mark Brownlow (Editor’s note: Never heard of him), Rose Servitova, Amy D’Orazio, Joana Starnes, Melanie Schertz, and Summer Hanford/Renata McMann, to name just a few. That is what I am calling #Austenesque stories: work which is inspired by the characters of Jane Austen, but not seeking to replicate an Austen story. #Austenesque works consider the interesting possibilities raised by the characters and the canvas backdrop against which they are painted. Q: Talking of evolving approaches, in “The Maid and The Footman” you focus more on the perspective of the servants. What was your motivation behind that? Truly, I had not intended to create the paired version of my novella Of Fortune’s Reversal. However, as I was going back through much of my earlier work (as well as reflecting upon the trend AWAY from “Great Man History” in my field), I began to see this image of “Lessers” appear. General Sir Richard Fitzwilliam contemplates the disparity of position between the governess Kitty Bennet and himself as the young lady begins her recovery. Here he is not exploring the gulf between servants and gentry. However, this clarifies itself in Epilogue (1) in OFR where Darcy is musing about Richard Fitzwilliam’s emerging egalitarian attitudes in spite of his elevation to the Barony of St. Jean. In addition, I had, by the time I had reached the end of OFR, developed the characters for Annie Reynolds and Henry Wilson into something much more than the grey entities who opened doors and fetched smelling salts. T’was a natural step for me to explore how their love affair (they are already wed in the Epilogue) grew. But, what shaped their relationship? That question was the beginning of The Maid and The Footman. As a historian, I felt that Annie and Henry’s story would respond to the technique we call “subaltern history,” that is the history of sergeants rather than generals. T’was useful that Henry had recently been demobilized after Waterloo. What is important to remember is that “traditional” Regency and 19th Century romances composed in the 20th and 21st Centuries tend to focus on the interactions between the upper crust men and certain levels (lordy not the servants) of impoverished gentlewomen. Yet, a few inversions of this formula are notable and memorable…like D.H. Lawrence’s Lady Chatterley’s Lover and Julian Fellowes’ pairing of Lady Sybil Crawley and the chauffeur Tom Branson. I firmly believe that those living in ruder circumstances are still driven by the most profound of human emotions. Does their birth make them any less interesting…their truths any less worthy of being explored? Q: You’ve already mentioned that male authors are not all too common in this genre. Have you found any challenges (or advantages!) associated with being a male writer in the Austenesque world? I have not really run into any gendered opposition. However, a male writer needs to be uniquely aware of the dangers of writing female characters. I commend Virginia Woolf’s A Room of One’s Own to every male author. She is spot on when she highlights the “manly” form of writing where the male ego shadows the page with “I” and makes the writing less appealing. I believe that the genre is destined to be the realm of women writers for a considerable period yet if the seminar room at the University of Washington’s JaneFest is any indication—100 persons…maybe 92 of them were women. The men (excluding the presenter) were “dragged” there by their significant others. Yet, if this is the realm in which we have chosen to write, I believe that it is incumbent upon us to write in an as accessible a manner as possible. I try to make every effort to write using the Coleridge/Woolf androgynous mind where the division between the male mind and the female mind is erased. For me, when I am able to attain that, I feel that the inner discourse and defining truth of the characters is revealed and can be appreciated by all. Q: In recent weeks, you’ve also invested a lot of time in developing audiobook versions of your portfolio. You’ve said this is to give people another way to engage with your work. Are there any special challenges for an author preparing a book for audio and managing the production process? For an author, I think it is imperative to determine what sort of “read” you are seeking. If your desire is to have a faithful Alexa/Siri rendition of every word laid down on the page, you will head in one direction. I, however, tend to write my books as a sort of recreation of the visual that I see in my mind. I, therefore, am looking for an interpretive performance. Thus, I need to reconsider each work as an aural performance. That does not mean that I alter the actual text in significant ways, essentially writing a new book, but rather creating a script that “works” when read aloud. Thus, some items which can be used on the printed page cannot/will not work in audio. While you will “catch it” when proofing, it would be better to make the alt than forcing a revision after the fact. At the end of it, though, it is your relationship with your voice talent. You have to respect their judgement as well as your own. They must be an equal partner in the process. I have frequently given the performers their head: supplying limited notes in advance of the table read. Ultimately, I feel that you need to trust that the performer is as professional as you are. That matchup will, I believe, deliver the most rewarding experience for those choosing to engage the books in this format. I was also a big fan of the film versions of the novels, particularly Mansfield Park. Q: What is your favourite Austen novel? Q: What is your favourite Austen quote (from a book or letter)? Never really considered one in specific. I am a great fan of her writing process. The manuscripts are of great interest to me…we can watch her work her way through particularly knotty problems, in the process changing action, characters and dialogue. Q: What are your other literary inspirations and favourite authors? Q: Do you have any writing rituals? Starbucks seems to be the place where I can isolate myself in the midst of the hustle and bustle. Then, of course, there are the dozens of fragments scribbled at all hours. Finally…not a ritual…but ideas, scenes and so on get dropped in between the end of WIP and End Notes. Looking forward to “talking” with your readers, Mark! Hello! Stopping by for the first time. I’m very much looking forward to reading books by you both (Don and Mark). Don, your thoughts on subaltern history, as well as JAFF vs. Austenesque, are fascinating, and I really appreciate your point about using this realm as a place for exploring ideas and characters, not just paying tribute. Jane Austen’s genius comes from her social commentary and humor (not necessarily her romantic pairings, much as I love them). As a writer, I probably fall into the tribute camp more often than not, but as a reader, I celebrate your desire to open the possibilities of the Austenesque space! I’m also very glad to see male authors involved in this genre. I think often about how I, as a female, write male characters (probably not all that accurately!). Writing from another’s perspective is one of the joys (and terrors) of storytelling. Done well, such writing can be a beautiful exercise in empathy. Thanks to you both for the thoughtful interview! Thanks for the kind and thoughtful words, Christina. The beauty of it all, I think, is that there is plenty of room for different approaches to Austen-related fiction. I’ve been delighted at the positive reaction to being a male author in the genre, particularly from other authors. I feel a bit ashamed that I expected at least some negativity. Lesson learnt!